Since this is a blog about contemporary Christian romance, I thought it’d be fun to take a trip down memory lane and tell you about one of my first books ever published. The cover is Christmasy but it is more of a Thanksgiving book. Just out of nursing school, Holly can’t risk any distractions. She knows a slipup could cost a life. Like the mistake she made years ago that still plagues her conscience. When she runs into old high school friend Matthew Cook, she hesitates to let romance into her life. Even if the handsome baker is as delectable as his fabulous pastries. She didn’t notice him back in high school, but things have sure changed. Now that Matthew has Holly’s attention, maybe the holiday season is the perfect time for him to show her that she deserves to have it all—work, family, friends and a love that lasts a lifetime. Here is a peak inside. Matthew Cook’s breath crystallized in the cold mountain air as he stepped onto the wooden porch of his house to greet his sister and three-year-old niece. Winter had come early in Leavenworth, Washington. Snow had yet to fall, but the thermometer had dropped twenty degrees overnight. Ava looked up at her mother. Ava gave him a quick, shy hug then slipped her hand into April’s. “She’s going through a phase,” his sister explained quietly. “Don’t be offended. 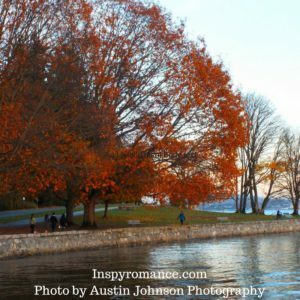 Once she warms up to you, you’ll wish she thought you were a stranger.” She grinned, walked to the back of her Subaru Forester and opened the trunk. “If it would’ve fit, I may have. Two months is a long time to have to pack for a three-year-old. Now help me bring all this stuff inside and stop griping.” She grinned and playfully nudged him. Little Ava squealed as her foot skidded off the step. April reached out to steady her on the slippery surface leading to his front porch. Arms flailed and bodies tumbled. Matthew rushed forward to help, but before he took two strides April and Ava were in a heap at the bottom of the stairs. He dropped the luggage then knelt beside them. April’s shoulder jutted out at an unnatural angle, and she groaned. Tears flooded Ava’s eyes, and she began to wail. April just lay there, not seeming to notice her hysterical daughter. “It’s okay, Ava,” he said. The child looked uninjured by the fall. He picked her up and held her close until she calmed. Her little body shuddered. “Mommy?” She leaned toward April who still lay on the cold concrete in a daze. “Yes. But the doctor will make her all better.” He put Ava into her car seat and stared at the straps. Now what? Ava slipped her arms behind the shoulder straps and clicked a plastic thing at her chest. Matthew grinned. No one called him Matt, but coming from this blue-eyed little cutie with dark blond curls framing her sweet face, he didn’t mind. He rushed to his sister’s side. I hope you enjoyed the snippet. I don’t want to give the story away, but I will say the main characters in this book had a very memorable Thanksgiving. I will never forget the Thanksgiving my parents took/dragged my sister and I away from Thanksgiving at our grandparents house to go to Montana. We arrived very late at night, or maybe it was the wee hours of the morning and we were staying in a church basement–I have no idea why. That morning my mom freaked out when she realized the church had a pre-school and little kids could be walking in on us at any moment. We rushed to get everything tidied up and then she realized it was closed since it was the day after Thanksgiving. I don’t remember much else about that trip except that it was super cold. How about you? Do you have a special memory related to Thanksgiving, or this time of year? Hi Wemble, I’m not sure why A Holiday Proposal isn’t showing up on the Australian site. It was my understanding that the Heartsong Presents line was available there. How disappointing. I find it fascinating to think about the different seasons you experience for traditional holidays. Easter in the Fall sounds beautiful even though I’ve always associated it with Spring. I love autumn too, Kimberly, although I’m not a big fan of the cold weather behind it. Thanks for sharing the excerpt, I enjoyed it. I remember one Thanksgiving I was in charge of the dessert and, for the first time I tried to make a homemade pie. The crust came out great, but when my father sliced into it, a river of chocolate oozed. He said, “I think I need a straw to eat this.” The pie was officially named, “The Straw Pie.” Next year, I bought a pumpkin pie. Enjoy the time with your family! It’s been one of the warmest falls I can remember this year here in Oregon. We actually were in the upper 60’s and mostly sunny this past week. I don’t mind cold weather, but I do get sick of rain. Your dad sounds like he has a fun sense of humor. :) I’m not good at pies and buy mine too. I remember the first year we had friends coming over for Thanksgiving (it was the first one in our home and we ended up gathering many students who, just like us, were not going home to be with their families for the holidays). We made last minute plans and were in charge of getting the turkey. I recall my husband calling me from the supermarket and saying: there’s only one left, do you want me to go try another store or should we just take this one. I was shocked (though only partially because it was a last minute decision) and told him to get whatever was in front of him and we’d make do, since there were no guarantees the other store would have any. As a gathering of people with different traditions, we ended up with a lot of food left, but it was fun. The only frustration I had was having forgotten to use my best dinnerware set (which I had separated specially for the occasion) because it all ended up getting confusing in the end. What a fun memory, Priscilla! I love that you had students over. As a mom with college students who can not always get home, I really appreciate people who open their homes. Living in the Midwest, autumn is my favorite time of year. As a naturalized American citizen, Thanksgiving is special because it is an American holiday. Even as immigrants, my parents embraced this new country by learning English and its customs and traditions. With the help of my Great Aunt and Uncle, my mom learned to make scrumptious turkey dinners with pumpkin pie for dessert. A family favorite is Giblet Dressing – now handed down for four generations. With my German roots it is fitting that the setting of A Holiday Proposal is Leavenworth, Washington. Even though I have not had the privilege of visiting the state of Washington or Leavenworth, my husband has. He was in Washington state on business and made a weekend trip to Leavenworth. He purchased a magnet, which is on my refrigerator. The Bavarian architecture reminds us of Frankenmuth, Michigan. Thanks for sharing. 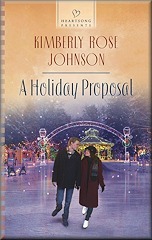 Will A Holiday Proposal ever be a Kindle e-book? Happy Thanksgiving and Happy Writing! Renate, I love how you have embraced the traditions of Thanksgiving. As far as A Holiday Proposal being in ebook goes, I’m at a loss. When I wrote this post it was available for Kindle as were all of the other books in the series. Because of you question I went over to Amazon to see what was going on and noted that the only book in this series currently being sold as an ebook is the first in the series, The Christmas Promise. I don’t know how to answer your question. It’s always been in ebook, I don’t understand it’s not or if it will be again. I will try and find out what is going on. I even checked the publishers site and it’s not available there either. Since having to cut out the only family I have around here from my life Thanksgiving is going to be pretty sad this year and the next few years with just me and my daughter. It will be worse when she goes off to college and her life but yea. I am going to just do my best to try to treasure what I can of these last few years with her. I’m sorry about your family situation, Cassandra. I hope you can find a way to enjoy it in spite of your circumstances. We’ve invited friends over for Thanksgiving some years and enjoyed changing things up. Treasuring that time with your daughter is a great plan. My family is coming from KS to SC for Thanksgiving, so I’m really excited! Cool, Katy C.! I hope you all have a fun and blessed time together. It’s interesting…….the more we talk and I hear from you the more I find we have so much in common. I find it funny that your story is based in Leavenworth, Washington. That’s where Larry and I went for our honeymoon, AND it was the weekend before Thanksgiving. Fun memories! What a wonderful place to honeymoon! My son is going to a wedding there in January. I have an entire series set in Leavenworth. :) I love that place. It would have been great, but we were booked in a B&B and there was a wedding party going on downstairs, there was only one bathroom and the walls seemed a bit thin. Being a newly wed couple this wasn’t exactly what we had hoped for. We ended up only staying one night and then going to his parents town because of Thanksgiving. Needless to say….I’d love a second honeymoon! Thanks for the excerpt from your book. I have so many Thanksgiving memories. I always make pumpkin pies for Thanksgiving. One year my hubby took Thanksgiving dinner to the guy who was manning the guard house for our gated community. Hubby took him everything, including a piece of pie. We all gorged ourselves with the meal and didn’t try any pie until late in the day. When I took a bite of my pie, I knew immediately that I had left out the sugar. No one could eat it. They all begged me to make another one. I did have an extra can of pumpkin still in the pantry and whipped up another pie as soon as I could. Then we remembered the poor guy at the guard house. He had to eat a bad piece of pie. The next day hubby asked him about his meal. The guard said he didn’t mind the pie at all. He must have had some pretty bad pieces of pumpkin pie in his life to think mine was good. We still laugh about that today. Kimberly, I also wanted the book in e-book but it wasn’t available. I decided to go ahead and order the book since I am a Prime member and get free shipping.I have enjoyed so many of your books that I knew I would really enjoy this one too. I have fond memories of Thanksgiving when I was growing up. We had what we called a family Thanksgiving reunion at my uncle’s house every Thanksgiving. Oh the fond memories. My uncle was a Methodist minister who is now retired. We would have the dinners in the church basement wherever he and his family would be located at the time. They moved around the southern area of Pennsylvania every few years whenever he would get a transfer to another church location. It was nice to see all of the small towns they lived in. Thank you, Nancy! That was very nice of you. I hope you enjoy it. What great memories. When I was young we often had large family get togethers with my mom’s side of the family. I always enjoyed getting to see my cousins. I contacted my publisher to see what’s going on with the Kindle version of this book. So far no word. However, one of the books in this series has a kindle book available and it’s the first in the series. This is my very first contracted book. Here is the back cover blurb for The Christmas Promise. No matter how lovely Keira Noble’s smile, or how adorable her four-year-old son. He’s been down that road before and knows it can lead to a broken heart. But that doesn’t mean he can’t help the pretty widow find a puppy to put under the Christmas tree for her son…. Pete claims he only wants to help her find the perfect gift for Cody. Yet Keira can’t deny the tender feelings in his eyes whenever he looks at her. Could this handsome Scrooge have a change of heart, and create a new family for Christmas? Thanks for the excerpt :) I look forward to reading the story! We go up to Washington to visit my sis-in-law and niece every Thanksgiving and eat at the buffet place near her home. No muss, fuss or clean-up…lol! For me, Thanksgiving has always meant bowling! Our family tradition is bowling on Thanksgiving! !